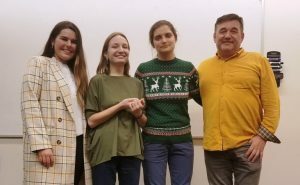 The Ukrainian Film Club of Columbia University (UFCCU), in collaboration with the non-profit organization Razom, held a screening of the documentary “Invisible Battalion” at Columbia University on March 29, 2019. 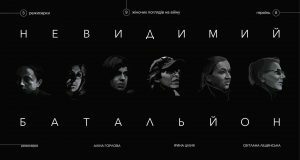 The documentary provided insights into the participation of women in the war in eastern Ukraine from the perspective of women. Maria Berlinska, a graduate of the National University of Kyiv-Mohyla Academy with a master’s degree in history and the head of the Ukrainian Centre for Aerial Reconnaissance, co-produced the documentary. Berlinska and Kateryna Prymak, another member of the women veteran’s movement in Ukraine, attended the screening and answered questions from the audience. Yuri Shevchuk, the founding director of UFCCU and Lecturer in Ukrainian in the Department of Slavic Languages at Columbia University, as well as a member of the board at the Shevchenko Scientific Society in the United States, made the opening remarks. He pointed out that the war between Russia and Ukraine is waged not only on the military front, but also in the cultural sphere. Even towns liberated from the rebel control remain in the grips of Russian propaganda, without access to good quality Ukrainian-language media content. As a representative of Razom, Maryna Prykhodko also welcomed the audience and moderated the discussion. Drawing upon their firsthand experience in Donbas, Berlinska and Prymak shared their perspectives on the conflict, gender equality, and the reintegration of war veterans upon the conclusion of their military service. Among issues raised by the documentary and discussed during the screening was the Post-traumatic Stress Disorder (PTSD) that many war veterans deal with upon returning from the frontline. Berlinska and Prymak discussed how the women veteran’s movement in contemporary Ukraine seeks to provide educational, professional and recreational opportunities for women veterans. For further information about their activities, please visit their Facebook page at https://www.facebook.com/InvisibleBattalion/.